Diamond Spirit is a series of books about a girl named Jess and her horse. Finally the day has come when Jess can bring home her filly Opal. But after Opal almost drowns in a flooded river, she falls ill and won't get better. Has Diamond's spirit abandoned her? This is the final book in the Diamond Spirit series. 'What did you decide to call her?' asked Lawson, looking over Jess's shoulder. 'Opal,' said Jess, gazing lovingly at the little chestnut foal. 'Bad - luck stones,' grunted Lawson. 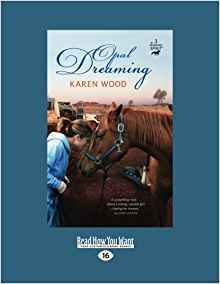 Wild with anger and refusing to give up, Jess heads west on an outback droving trip with her best friends - and Luke. Will she be able to bring Opal home? And could Luke be her once-in-a-lifetime boy? You have the second one but not the first? It's about a girl owning a horse named Diamond and then Diamond dies by getting caught in a cattle grid and the girl is trying to get over her then she stumbles across another horse just like her. Hey, Haley. I've got the first one can you tell me what the first diamond spirit is about? Return to Share Your Favorite Books About Horses!.